Yes, you notice…I left “reading” out of it. I’m going to share exactly one article today relevant to academic medicine; I believe it’s that important and I don’t want you to miss it as many of us consider issues of “talent acquisition and development” in our profession. We don’t have many WWII Veterans left out there. I’m grateful for the story from this one, and what a treat to see him fly in the plane he jumped from on D-Day! If you’ve kept up for any length of time around here, you know I am a fan of Eric Barker and his “Barking up the wrong tree” blog. 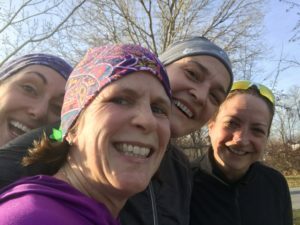 In mid-November he dropped some wisdom about the friends we need in our lives, and there’s no time better than the holidays to look at that list (and the list definitely relates to the picture above from yesterday’s run-these ladies and I have referred to one another as “hide a body” friends more than once!). Related, his book that came out this year is the best leadership book I’ve read in the last 3 years. Truly. I try to throw some good listening in here every once in a while. Chris Stapleton has a new album out as of Friday, and it’s worth your time. I promise. And because I do believe we can all use some levity, I think this may be the best story of 2017. Can we make #drunkpossum trend on Twitter? I ran away to Montana for a few days and suddenly it’s October. I don’t know why these things often surprise me, yet sometimes they do- particularly the months that change on the weekend. So, what do I think is interesting at the moment? In the world of burns, this article is one of what I hope will be many looking prospectively at blood product transfusion in our patients. Thanks to my friend Tina Palmieri for her fearless leadership of this important multi center trial. I’m excited to share this systematic review by my Utah colleagues examining endovascular vs. open repair of AAA. Hint: lower mortality, higher complication rate. The October issue of the American Journal of Surgery is the annual Association of Women Surgeons issue. Regardless of gender or specialty, there’s pretty much something for everyone in there. I hope this piece in Academic Medicine can help some of my pre-tenure friends and colleagues normalize their experience a bit. It’s not easy. It is worth it. In place of a bonus reading recommendation this month, you get a bonus viewing recommendation. I am completely smitten with Simon Sinek‘s work right now and am obsessed with finding ways to incorporate it into academic medicine. Don’t know who he is? Here’s his TEDTalk on “How great leaders inspire action.” 18 minutes well-spent, I promise. Yes, we’re almost a week into the month. In a somewhat unusual turn of events, I actually took the holiday weekend OFF. I thoroughly enjoyed it. So, what’s caught my eye recently? A few things. Which surgery residents are most at risk for attrition? We have some ideas based upon this outstanding paper. Now we need to figure out WHY this happens. We tend to be generous with pharmacologic therapies in the ICU setting, generally for good reason. Nevertheless, medication errors are one of the most common safety report issues in hospitals. This Clinical Practice Guideline from SCCM reminds us that we do need to be good stewards and identifies the opportunities for doing so. Are you struggling with giving your learners feedback? It’s not a surprise with the dearth of high-quality, evidence based recommendations. For those who aren’t aware that Montana has lost over 1 million acres to fires in the last two months, here’s a relevant online piece from the New Yorker. Between Harvey hitting my cultural homeland last week and watching a state I’ve grown to love burn, I’ve got a lot of sadness about events largely beyond anyone’s control right now. Irma is the proverbial frosting on the cake. Fun reading? I may have too many books going right now. I pulled out some Brian Doyle (The Plover) for my trip to Portland last weekend because it only seemed appropriate. If you’re not familiar with his work, this essay gives you a lovely taste of it. I’m reading (and learning from!) Michael Bungay Stanier’s The Coaching Habit. September book group is our annual foray into nonfiction, this month with Ta-Nahisi Coates Between the World and Me. Happy almost-Fall, y’all. Stay safe! It was the 4th before I realized it was time for a new reading round up. How did August happen?!? And, of course, we’re back to business this month after last month’s not-so-light reading. The “opidemic” is an issue getting plenty of press right now. And, of course, while patients deserve proper pain relief after we do things that hurt them (surgery, for example), we have an obligation to be responsible in our approach. Here’s more data about how often prescription opioids go unused after surgery. I’m proud of our group’s practice of carefully monitoring our prescribing practices, educating on safe storage, and providing lockboxes to patients. There’s no question that Oregon Health Sciences is ahead of the curve in their development and implementation of the concept of the Academic RVU. Here’s their story on how this happened and what it means for faculty. Intraoperative teaching is not easy, and we know less about it than we should. This systematic review synthesizes what we do know- particularly that there is often a disconnect between faculty and learner perceptions. And a recent nonfiction read that definitely provides some good food for thought: A Selfish Plan to Change the World by Justin Dillon. Any book that instructs readers to “find their riot”? That’s good enough for me. It’s that time! Here’s the July, 2017 edition of what I’m reading, supplemented with some of what I’m listening to. Here’s a hint: It’s summertime, and I’m not going to give you any academic reading right now. So there. June’s book group novel was La Rose by Louise Erdrich. The writing is lyrical, the story a bit magical…so much goodness, and it resulted in a juicy discussion. I’m just settling into July’s selection: Case Histories by Kate Atwood. I’ll report back, but the first 50 pages have been fascinating. Barking up the Wrong Tree by Eric Barker– I’ve recommended his Sunday blog/ email more than once. The book is a terrific complement to his usual investigation style that helps enhance personal success. From HBR, ways to weave self-care into your workday. I love that they also support the idea of not “shoulding” all over yourself. It’s an unhealthy practice. From the New Yorker, “America’s Future is Texas.” It’s a great explanation of how my home state really is a bellwether for current American politics. Sam Sanders (from NPR) is also an expat Texan and recently started his podcast, “It’s been a minute.” Tuesdays are a “deep dive” with another public figure, and Fridays are a catch-up for the week. Highly recommended- I’m listening to his interview with Timothy Simons as I type. For my foodie friends, I recently stumbled across “The Food Chain” from BBC. Each week they focus on a food or food culture related topic in a very approachable manner. Last but not least, a plug for NPR’s “Up First.” It comes out daily Monday-Friday and gives you 15 minutes of news highlights for the day. Happy Dog Days of summer, folks! So what’s out there that is catching my eye? We all spend quite a bit of time thinking about how to improve teaching of technical skills. What about using video-based coaching to supplement OR teaching? What does the public know (and want to know) about overlapping surgery? The 2016 State of the Science articles for burn care are out. These cover everything from burn resuscitation to community reintegration, and are all important comments on where we are in burn care (and how far we have to go). And bringing out my inner policy geek, here’s a great overview from Politico on what the impact is for the GOP if/ when Obamacare repeal fails. Catching my ear is the “Up First” podcast from NPR. I seldom have time to listen closely to the news throughout the day, so this is a great summary of what’s happening. I’ll start with an apology: I’ve not been on my A-game with keeping up with the blog lately. Lots of life distractions, many of which I’m hopeful will start to settle down soon. It’s not been easy. So, it is April, and a number of things out there have caught my eye. The March print edition of JAMASurgery included this systematic review and metaanalysis of causes of attrition in general surgery residency. While I’m reasonably certain we can’t get the rate to zero because there are factors we cannot control, we must do what we can. While we are all becoming painfully aware that too many narcotics are being prescribed for our patients, we tend to not have a good understanding of what constitutes too many or too much. This study provides an important baseline for us as surgeons. I will also note that Annals of Surgery will have an ongoing series examining the opiod crisis from a surgical perspective. We’re definitely talking more about delirium mitigation in our adult ICU patient population. What about the children? Apparently it’s a problem for them too (particularly with “inflammatory disorders,” which would definitely be my patient population!). Going a bit outside of the medical journals, what’s next in hospital innovations to keep patients safe? I was thrilled to see my friend Amir Ghaferi‘s name as first author on this piece. Pleasure reading? Our book group is spending the next two months with one of my all-time favorites: The Amazing Adventures of Kavalier and Clay by Michael Chabon. I am looking forward to re-experiencing it.